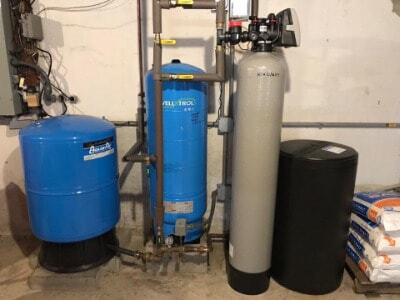 Installing water filter systems in the following areas: Springvale, Shapleigh, Acton, Alfred, Lebanon, Sanford, Newfield, Waterboro, North Berwick, Berwick, Hollis, Newfield, and York County. May be one of the best decisions you make when it comes to your family’s health. Some water problems are obvious, such as foul odors or red, green, blue, and brown staining. Looks are deceiving, however; radon, arsenic, and other harmful minerals are invisible, so that clear water might not be as pure as it appears. Because clear does not always mean clean. Even if you’re on a public water system, you should consider a well water filtration system. The Environmental Protection Agency (EPA) suggests having your water tested once a year, whether you’re on a private well or using city water. Detecting nitrates, coliform bacteria, and other contaminants early is crucial, especially since they may take years to fully flush out. This doesn’t mean we’ll recommend you install or replace your current well water treatment systems, but you’ll gain the peace of mind knowing your water is clean. That yearly test is also a good time for a filter cleaning. To schedule your annual water treatment service or to learn more about our water filters and how they can benefit you, call (207) 324-1645 today!